Gold Mercury International grants Ad-Honorem Awards to industry leaders that have contributed to generate progress by increasing trade relations with other nations while improving international cooperation. 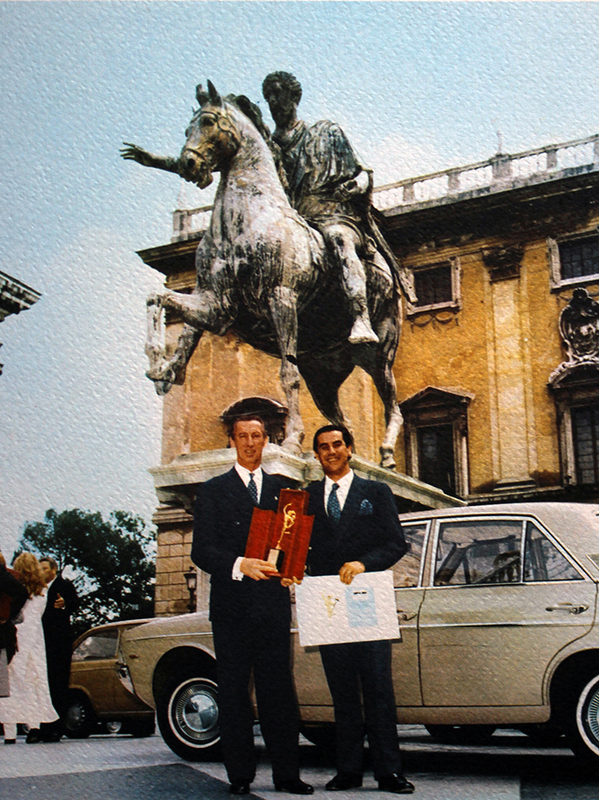 Don Jose Ignacio Domecq (left) in May 1970 at the Capitoline Hill in Rome with Don Manuel Domecq-Zurita, after receiving the Gold Mercury Corporate Award for his contribution to developing international cooperation through trade. 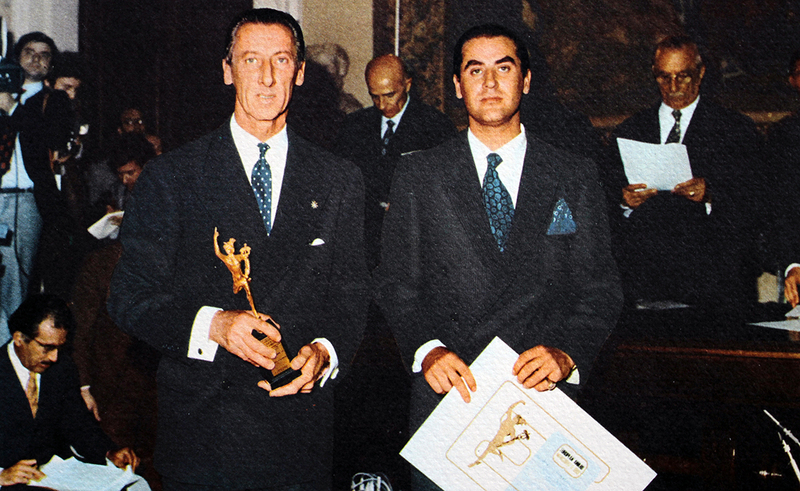 One of our historic Laureates is Don Jose Ignacio Domecq who won the Gold Mercury Award in May 1970. The award was presented at the Gold Mercury annual ceremony at the Capitoline Hill (Campidoglio) in Rome. says Eduardo De Santis, Chairman Gold Mercury, who presented Domecq the Award in 1970. Jose Ignacio Domecq Gonzalez, was the aristocratic head of the Spanish wine-making family who owned Pedro Domecq, one of Spain’s oldest and largest sherry and brandy shippers, from 1816 until 1994, when it was merged with Allied Lyons P.L.C., the beverages giant based in London. It is now known as Allied Domecq P.L.C. The tall, lean Mr. Domecq was known throughout the international wine trade as ‘El Nariz’ for literal as well as figurative reasons. His hawk like nose, endlessly caricatured in profile, was memorably large. It was also his fortune, an indispensable gift in the blending necessary for creating fine sherries. From childhood on, he said, he memorized aromas and tastes ranging from those of the freshly pressed must of palomino grapes to those of the rich, old dry sherries called olorosos dating to 1730, when the company was founded. Its rise began in 1816 when a forebear, Pedro Domecq, acquired it and gave it his name. Strolling through a bodega, dipping out old sherries which have rested undisturbed for generations, must be one of the most satisfying encounters a man can have with wine”. One watches human egos come and go — all talking loudly about market trends etc., in the jargon of the moment — while the wine ignores them all and silently ages, turning itself with our tactful guidance into the same lovely old perfection enjoyed by our ancestors”. Mr Domecq died in 1997 at his home in Jerez de la Frontera, in southern Spain. He was 82.